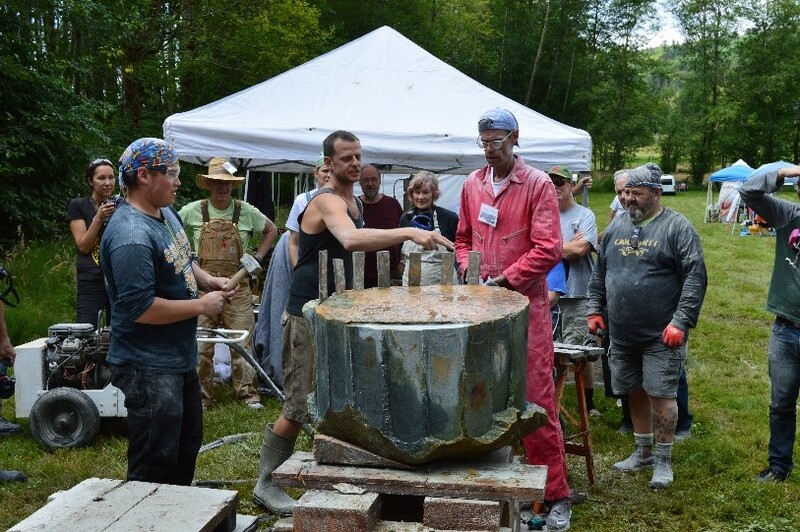 At each NWSSA International Symposium our organization creates an area where persons who have never carved, or haven’t carved for a long time, have an opportunity to create a stone sculpture. A large tent is provided. Work tables and bankers are available. All manner and types of tools can be checked out to use. An experienced sculptor is present to make sure that anyone can get started on a project, learn about safety, tool use, stone selection, design and more. This area has always been called “the beginner’s tent.” The term has never been a true fit for this special place. The area is so much more than a place for 1st time carvers. It is a “seed bed” for people who want to try something new, for carvers who haven’t touched a stone in years and want a refresher, for experienced carvers who want to try out a new tool, work out a design problem, or just need advice on a project. It’s really an on-field hub. This year, as we set up the tent area, I expressed my exasperation of the term “beginner’s tent” to those who were helping ...but I had no alternative name. The next day, a work-study fellow, Grant, suggested “The Dojo.” I was familiar with the word as we have a Dojo on Lopez Island. It’s a peaceful building in the woods that is used by various groups as a place to exercise, sing, or meditate. The word for me meant a place that was inclusive, inviting, and open. It felt right to me, but was it just a little too “strange” for our group? “Immersive learning” is certainly what we’re about in our Dojo. The learning often involves stone, or tools, or learning about yourself...it’s all up to you. As the week progressed, the term The Dojo was embraced by many. Our Dojo was a place of great learning, much patience, and a good share of happiness. WELCOME to our creative place where everyone is on the safety team and helps to ensure an enjoyable time for all, including our visitors. Be aware of the safe use of tools and considerate toward protection of the grounds and camp facilities. Drive slowly (15 mph) and watch for pedestrians and wildlife. PERSONAL SAFETY is #1, Wear clothing and footwear that is safe to work in at camp. Safety gear for eyes, ears, and respiratory system is required. Be careful on uneven surfaces and use a light after dark. We want a safe and trusting time with other artists. SAFE TOOLS & WORK AREA is your responsibility, so keep your workspace safe at all times, and secure it when you are not present. Unplug all power tools when you’re away. Electrical connections should be protected from moisture, particularly at night. Be mindful of your flying chips and the dust you create. Be prepared to add extra sides to your canopy for excessive dust, or to be asked to work in a different area. Inspect your power tools, hand tools, electrical cords, and all connections each day for proper working condition. Visitors may not use or handle your power or pneumatic tools. VEHICLES Drive slowly!!! Drivers must keep an eye out for people and equipment while driving on the work field and camp areas. If the driver is unsure or backing up, the driver must ask for someone to guide and spot them. DRUG & ALCOHOL POLICY Consumption or possession of alcohol by any guest under 21 on Camp property is strictly prohibited. Consumption is not allowed on the field while power tools are in use. The use or possession of illegal substances/drugs on Camp property is strictly prohibited. SMOKING The Camp enforces a no smoking policy in all of their facilities. You may smoke outdoors. You must carefully extinguish all cigarettes to reduce the risk of fire and appropriately dispose of cigarette butts. DEMONSTRATIONS Please remember to wear safety protection while attending instructor demonstrations. PERSONAL PROPERTY is your responsibility: tools, equipment and your sculptures on exhibit. VISITORS Visitors are welcome and should check in with staff upon arrival. 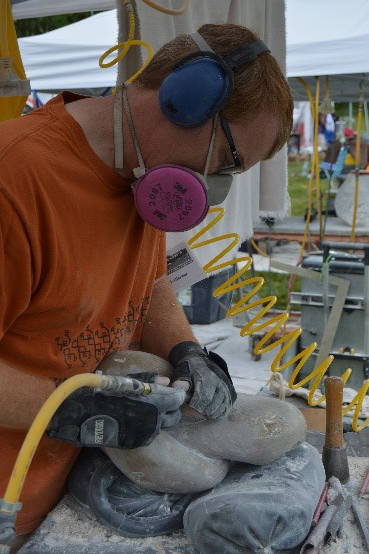 Eye, hearing and respiratory protection should be worn while observing work in the carving area. Thank you, and Carve Proud! • Ear plugs!! Very important (she recommends the foam disposable ones) and bring a small case to put them in. • Sketch pad and pencils etc. • Plasticine for making maquettes. She usually brings some with her as well. Keep in mind, there is an additional materials fee, depending upon the size and quality of jade you select for your project.